Braylin Falls is an amazing free fall slide with a protective safety net. Braylin Falls is a two lane slide with a dual slip and slide attached. Braylin Falls can be used as a water slide or a dry slide. 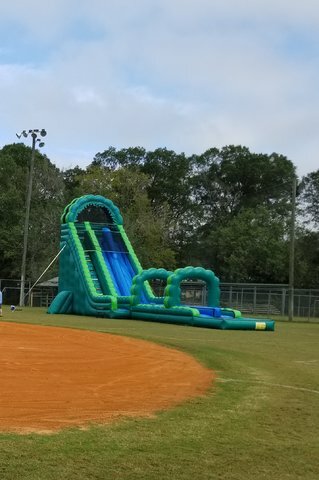 It is equiped with a soaker hose at the top of the slide. All you have to do is attach a garden hose and let the party begin. This amazing unit requires a flat surface for installation and within a 100ft of a power source. Braylin falls will keep you cool on a hot day or get your blood rushing on a nice fall day.